"Mesmer" redirects here. For other uses, see Mesmer (disambiguation). Franz Friedrich Anton Mesmer (/ˈmɛzmər/; German: [ˈmɛsmɐ]; 23 May 1734 – 5 March 1815) was a German doctor with an interest in astronomy who theorised that there was a natural energy transference that occurred between all animated and inanimate objects that he called animal magnetism, sometimes later referred to as mesmerism. A similar idea has been revived by New Age spiritualists in modern times. Mesmer's theory attracted a wide following between about 1780 and 1850, and continued to have some influence until the end of the century. In 1843 the Scottish doctor James Braid proposed the term hypnosis for a technique derived from animal magnetism; today this is the usual meaning of mesmerism. Mesmer was born in the village of Iznang, on the shore of Lake Constance in Swabia, Germany, a son of master forester Anton Mesmer (1701—after 1747) and his wife, Maria/Ursula (née Michel; 1701—1770). After studying at the Jesuit universities of Dillingen and Ingolstadt, he took up the study of medicine at the University of Vienna in 1759. In 1766 he published a doctoral dissertation with the Latin title De planetarum influxu in corpus humanum (On the Influence of the Planets on the Human Body), which discussed the influence of the moon and the planets on the human body and on disease. This was not medical astrology. Building largely on Isaac Newton's theory of the tides, Mesmer expounded on certain tides in the human body that might be accounted for by the movements of the sun and moon. 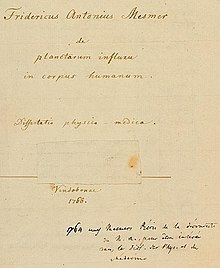 Evidence assembled by Frank A. Pattie suggests that Mesmer plagiarized a part of his dissertation from a work by Richard Mead, an eminent English physician and Newton's friend. However, in Mesmer's day doctoral theses were not expected to be original. In January 1768, Mesmer married Anna Maria von Posch, a wealthy widow, and established himself as a doctor in Vienna. In the summers he lived on a splendid estate and became a patron of the arts. In 1768, when court intrigue prevented the performance of La finta semplice (K. 51), for which the twelve-year-old Wolfgang Amadeus Mozart had composed 500 pages of music, Mesmer is said to have arranged a performance in his garden of Mozart's Bastien und Bastienne (K. 50), a one-act opera, though Mozart's biographer Nissen found no proof that this performance actually took place. Mozart later immortalized his former patron by including a comedic reference to Mesmer in his opera Così fan tutte. In 1774, Mesmer produced an "artificial tide" in a patient, Francisca Österlin, who suffered from hysteria, by having her swallow a preparation containing iron and then attaching magnets to various parts of her body. She reported feeling streams of a mysterious fluid running through her body and was relieved of her symptoms for several hours. Mesmer did not believe that the magnets had achieved the cure on their own. He felt that he had contributed animal magnetism, which had accumulated in his work, to her. He soon stopped using magnets as a part of his treatment. In the same year Mesmer collaborated with Maximilian Hell. In 1775, Mesmer was invited to give his opinion before the Munich Academy of Sciences on the exorcisms carried out by Johann Joseph Gassner (Gaßner), a priest and healer who grew up in Vorarlberg, Austria. Mesmer said that while Gassner was sincere in his beliefs, his cures resulted because he possessed a high degree of animal magnetism. This confrontation between Mesmer's secular ideas and Gassner's religious beliefs marked the end of Gassner's career as well as, according to Henri Ellenberger, the emergence of dynamic psychiatry. The scandal that followed Mesmer's only partial success in curing the blindness of an 18-year-old musician, Maria Theresia Paradis, led him to leave Vienna in 1777. In February 1778 Mesmer moved to Paris, rented an apartment in a part of the city preferred by the wealthy and powerful, and established a medical practice. Paris soon divided into those who thought he was a charlatan who had been forced to flee from Vienna and those who thought he had made a great discovery. In his first years in Paris, Mesmer tried and failed to get either the Royal Academy of Sciences or the Royal Society of Medicine to provide official approval for his doctrines. He found only one physician of high professional and social standing, Charles d'Eslon, to become a disciple. In 1779, with d'Eslon's encouragement, Mesmer wrote an 88-page book, Mémoire sur la découverte du magnétisme animal, to which he appended his famous 27 Propositions. These propositions outlined his theory at that time. Some contemporary scholars equate Mesmer’s animal magnetism with the Qi (chi) of Traditional Chinese Medicine and mesmerism with medical Qigong practices. In 1784, without Mesmer requesting it, King Louis XVI appointed four members of the Faculty of Medicine as commissioners to investigate animal magnetism as practiced by d'Eslon. At the request of these commissioners the King appointed five additional commissioners from the Royal Academy of Sciences. These included the chemist Antoine Lavoisier, the doctor Joseph-Ignace Guillotin, the astronomer Jean Sylvain Bailly, and the American ambassador Benjamin Franklin. The commission conducted a series of experiments aimed not at determining whether Mesmer's treatment worked, but whether he had discovered a new physical fluid. The commission concluded that there was no evidence for such a fluid. Whatever benefit the treatment produced was attributed to "imagination." But one of the commissioners, the botanist Antoine Laurent de Jussieu took exception to the official reports. He wrote a dissenting opinion that declared Mesmer's theory credible and worthy of further investigation. The commission did not examine Mesmer, but investigated the practice of d'Eslon. In August 1784 Mesmer visited a Mesmeric society in Lyon. In 1785 Mesmer left Paris. In 1790 he was in Vienna again to settle the estate of his deceased wife Maria Anna. When he sold his house in Vienna in 1801 he was in Paris. Mesmer was driven into exile soon after the investigations on animal magnetism although his influential student, Armand-Marie-Jacques de Chastenet, Marquis de Puségur (1751-1825), continued to have many followers until his death. 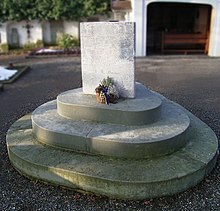 Mesmer continued to practice in Frauenfeld, Switzerland, for a number of years and died in 1815 in Meersburg, Germany. Abbé Faria, an Indo-Portuguese monk in Paris and a contemporary of Mesmer, claimed that "nothing comes from the magnetizer; everything comes from the subject and takes place in his imagination, i.e. autosuggestion generated from within the mind." ^ "Mesmer". Random House Webster's Unabridged Dictionary. ^ De Imperio Solis ac Lunae in Corpora Humana et Morbis inde Oriundis (On the Influence of the Sun and Moon upon Human Bodies and the Diseases Arising Therefrom (1704). See Pattie, 16. ^ Steptoe, Andrew (1986). "Mozart, Mesmer and 'Cosi Fan Tutte'". Music & Letters. 67 (3): 248–255. doi:10.1093/ml/67.3.248. JSTOR 735887. ^ Gielen & Raymond, 32ff. "Classics: Memoir on the Discovery of Animal Magnetism (Franz A. Mesmer)" [Classics: Memoir on the Discovery of Animal Magnetism (Franz A. Mesmer)]. Actas Luso-españolas de Neurología, Psiquiatría y Ciencias Afines (in Spanish). 1 (5): 733–9. Sep 1973. ISSN 0300-5062. PMID 4593210. Akstein D (April 1967). "Mesmer, the Precursor of Spiritual Medicine (I)" [Mesmer, the Precursor of Spiritual Medicine (I)]. Revista Brasileira de Medicina (in Portuguese). 24 (4): 253–7. ISSN 0034-7264. PMID 4881184. Darnton, Robert (1968). Mesmerism and the End of the Enlightenment in France. Cambridge: Harvard University Press. ISBN 978-0-674-56951-5. Eckert H (1955). "An Unknown Portrait of Franz Anton Mesmer" [An Unknown Portrait of Franz Anton Mesmer]. Gesnerus (in German). 12 (1–2): 44–6. ISSN 0016-9161. PMID 13305809. Ellenberger, Henri (1970). The Discovery of the Unconscious. New York: Basic Books. ISBN 978-0-465-01672-3. Fenton, Peter Robert (1996). Shaolin Nei Jin Qi Gong: Ancient Healing in the Modern World. York Beach: Samuel Weiser. ISBN 978-0-87728-876-3. Forrest D (October 2002). "Mesmer". The International Journal of Clinical and Experimental Hypnosis. 50 (4): 295–308. doi:10.1080/00207140208410106. ISSN 0020-7144. PMID 12362948. Gallo DA, Finger S (November 2000). "The Power of a Musical Instrument: Franklin, the Mozarts, Mesmer, and the Glass Armonica". History of Psychology. 3 (4): 326–43. doi:10.1037/1093-4510.3.4.326. ISSN 1093-4510. PMID 11855437. Gielen, Uwe; Raymond, Jeannette (2015). "The curious birth of psychological healing in the Western World (1775-1825): From Gaβner to Mesmer to Puységur.". In Rich, Grant; Gielen, Uwe (eds.). Pathfinders in international psychology. Charlotte, NC: Information Age Publishing. pp. 25–51. Gould, Stephen (1991). Bully for Brontosaurus. New York: Norton. ISBN 978-0-393-30857-0. Gravitz MA (July 1994). "The First Use of Self-Hypnosis: Mesmer Mesmerizes Mesmer". The American Journal of Clinical Hypnosis. 37 (1): 49–52. doi:10.1080/00029157.1994.10403109. ISSN 0002-9157. PMID 8085546. Iannini R (1992). "Mesmer and mesmerism" [Mesmer and Mesmerism]. Medicina Nei Secoli (in Italian). 4 (3): 71–83. ISSN 0394-9001. PMID 11640137. Kihlstrom JF (October 2002). "Mesmer, the Franklin Commission, and Hypnosis: A Counterfactual Essay". The International Journal of Clinical and Experimental Hypnosis. 50 (4): 407–19. doi:10.1080/00207140208410114. ISSN 0020-7144. PMID 12362956. Lopez CA (Jul 1993). "Franklin and Mesmer: An Encounter". Yale Journal of Biology and Medicine. 66 (4): 325–31. ISSN 0044-0086. PMC 2588895. PMID 8209564. Mackett, J (June 1989). "Chinese Hypnosis". British Journal of Experimental & Clinical Hypnosis. 6 (2): 129–130. ISSN 0265-1033. Makari GJ (February 1994). "Franz Anton Mesmer and the Case of the Blind Pianist". Hospital and Community Psychiatry. 45 (2): 106–10. doi:10.1176/ps.45.2.106. ISSN 0022-1597. PMID 8168786. Mesmer, Franz (1980). Mesmerism. Los Altos: W. Kaufman. ISBN 978-0-913232-88-0. Miodoński L (2001). "Romantic Medicine in Germany as the Philosophical Explication for Understanding the World and Man – Mesmer and Mesmerism" [Romantic Medicine in Germany as the Philosophical Explication for Understanding the World and Man - Mesmer and Mesmerism]. Medycyna Nowozytna (in Polish). 8 (2): 5–32. ISSN 1231-1960. PMID 12568094. Parish D (February 1990). "Mesmer and His Critics". New Jersey Medicine: The Journal of the Medical Society of New Jersey. 87 (2): 108–10. ISSN 0885-842X. PMID 2407974. Pattie, Frank (1994). Mesmer and Animal Magnetism: A Chapter in the History of Medicine. Hamilton: Edmonston Pub. ISBN 978-0-9622393-5-9. Pattie FA (July 1979). "A Mesmer-Paradis Myth Dispelled". The American Journal of Clinical Hypnosis. 22 (1): 29–31. doi:10.1080/00029157.1979.10403997. ISSN 0002-9157. PMID 386774. Schott H (1982). "Die Mitteilung des Lebensfeuers. Zum therapeutischen Konzept von Franz Anton Mesmer (1734-1815)". Medizinhistorisches Journal. 17 (3): 195–214. ISSN 0025-8431. PMID 11615917. Schott H (1984). "Mesmer, Braid and Bernheim: On the History of the Development of Hypnotism" [Mesmer, Braid and Bernheim: On the History of the Development of Hypnotism]. Gesnerus (in German). 41 (1–2): 33–48. ISSN 0016-9161. PMID 6378725. Shultheisz E (July 1965). "MESMER AND MESMERISM" [Mesmer and Mesmerism]. Orvosi Hetilap (in Hungarian). 106: 1427–30. ISSN 0030-6002. PMID 14347842. Spiegel D (October 2002). "Mesmer Minus Magic: Hypnosis and Modern Medicine". The International Journal of Clinical and Experimental Hypnosis. 50 (4): 397–406. doi:10.1080/00207140208410113. ISSN 0020-7144. PMID 12362955. Stone MH (Spring 1974). "Mesmer and His Followers: The Beginnings of Sympathetic Treatment of Childhood Emotional Disorders" (Free full text). History of Childhood Quarterly. 1 (4): 659–79. ISSN 0091-4266. PMID 11614567. Voegele GE (April 1956). "The Relation of Mesmer to Mozart". The American Journal of Psychiatry. 112 (10): 848–9. doi:10.1176/ajp.112.10.848. ISSN 0002-953X. PMID 13302494. Watkins D (May 1976). "Franz Anton Mesmer: Founder of Psychotherapy". Nursing Mirror and Midwives Journal. 142 (22): 66–7. ISSN 0143-2524. PMID 778805. 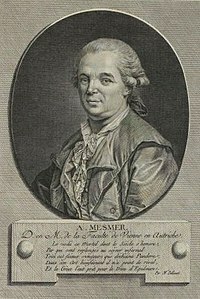 Wikimedia Commons has media related to Franz Anton Mesmer. Look up mesmerism in Wiktionary, the free dictionary. "Mesmer, Friedrich Anton" . The American Cyclopædia. 1879.